"Whole heads of natural garlic are aged for 1 month in a special high-heat fermentation process. The aged garlic turns a rich black color with a soft, chewy texture and a mild, sweet-savory taste that might be classified as “umami” (the fifth taste – mostly present in savory and meaty foods). Some describe it as having a balsamic or molasses-like taste, others compare black garlic to beef bouillon." 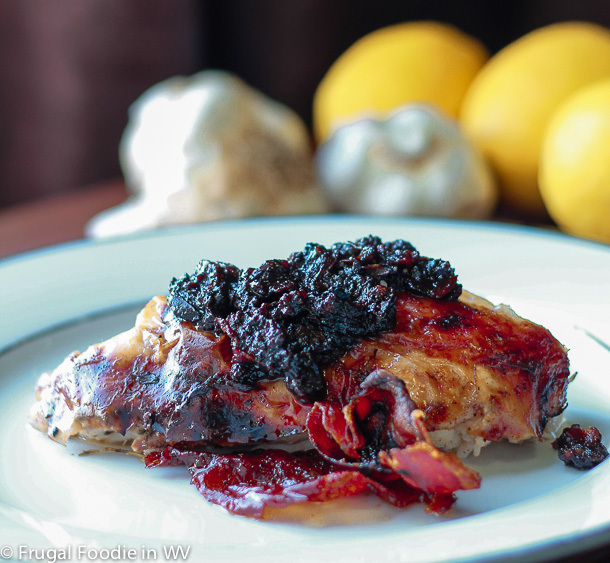 After looking through a number of recipes I found one that looked delicious and perfect for Whole Roasted Chicken Stuffed with Black Garlic. I changed the gravy from the original recipe and instead reduced the roasted garlic with a small amount of white wine and crumbled pancetta on top. I also found that my total cooking time was closer to 2 hours since I had a pretty large chicken. The result was delicious and I would definitely try black garlic again. For the recipe go to Whole Roasted Chicken. How interesting. I've never even heard of black garlic before and I honestly don't think they have it at my local grocery store, but you can bet I'm going to look. I had only seen it on cooking shows, but never in the store. It's easy to order online, I order a lot of things that I can't find in the store. Oooh, looks like I have another food I didn't know I needed to try! Black garlic! It really is great tasting! Thanks :) I really did enjoy trying the product! I have never seen black garlic. I really need to go food shopping more often.